Nearly three years after the start of the revolution in Tunisia, which was followed by uprisings across the Middle East and North Africa, many are beginning to examine what has changed in the region. Fighting still rages in Syria’s bloody civl war, Egypt has seen it’s democratically elected president removed by the military and sectarian divisions are rife. One of those that has had a front row seat of this recent history is the BBC’s Middle East Bureau Chief, Paul Danahar. 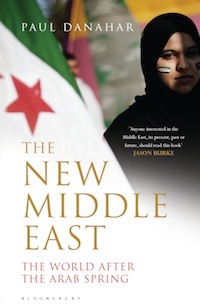 With a combination of access to the key players and extensive coverage on the ground his new book The New Middle East: The World After the Arab Spring, offers a fascinating and illuminating analysis of the new order. He will be joining us in conversation with BBC Arabic’s Samir Farah, to share his insight and analysis of events and what he feels the future holds for the region and its relationship with the West. Paul Danahar was the BBC’s Middle East Bureau Chief from 2010–13, running the organisation’s news coverage of the Arab Spring. He was awarded an MBE in 2003 for his work as the Baghdad Bureau Chief during the American-led invasion. Prior to his present posting he was the BBC’s East Asia Bureau Chief for three years, and previous to that he was the BBC’s South Asia Bureau Chief. In 2013 he was appointed the BBC’s North America Bureau Chief, based in Washington.